Here goes my second post for the beginner series that I started last month. 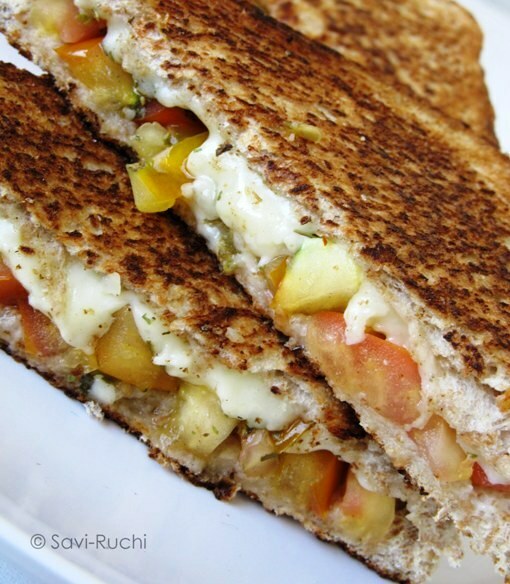 Though I have an electric griller, I always prefer to grill these sandwiches on my griddle/tawa/kavali. Mix the butter & the minced garlic & keep them aside. Take a slice of the bread. 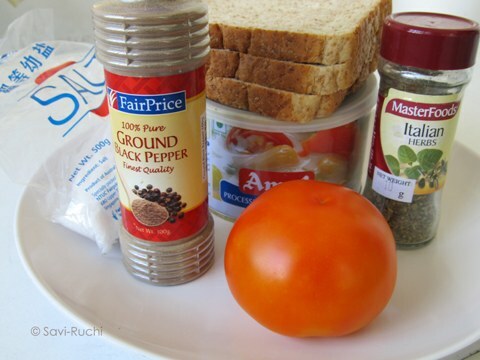 Spread the finely chopped tomato(1.5tbsp) on the bread. Sprinkle the salt, pepper & dried herbs. Spread the cheese on top of the tomatoes. 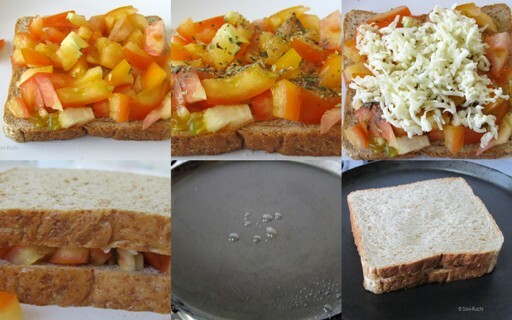 Take another slice of bread & place it on top of the cheese. Heat the griddle. When the griddle is medium hot, add few drops of garlic butter to the griddle. Reduce the heat. 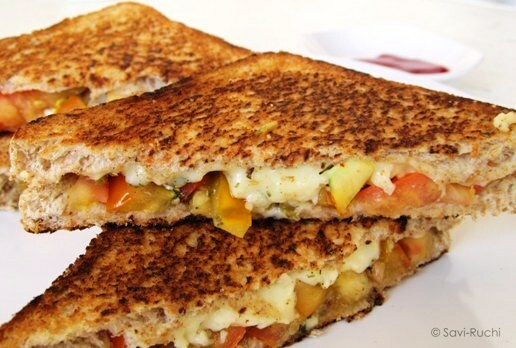 (The sandwich must be grilled on a low heat). Place the sandwich on the garlic butter & let it brown for a minute. Repeat the same for the other side of the sandwich too. Repeat the above steps for another sandwich. Cut them & serve them hot with a dip of your choice. Garlic butter enhances the taste of the sandwich. If you do not prefer them with garlic, go ahead & add normal butter. If you cannot find mixed herbs, then add finely chopped coriander leaves or mint leaves. These leaves add a nice flavor too. 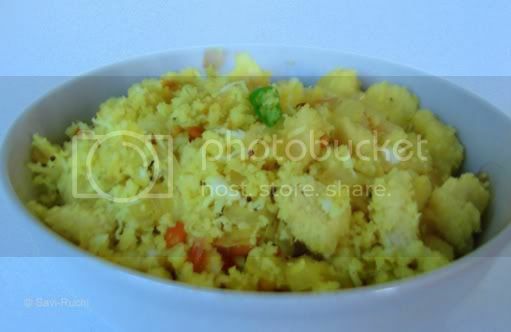 Boiled rice or Kerala rice (Rosematta rice) can also be used to prepare this dish. Kerala rice is a slightly different version of the normal brown rice. I do not have more information about them. I would be really happy if any one of you could share more about rosematta rice. I got this recipe from my aunt for rosematta rice. As I didnot have them, I tried with the brown rice & it tasted great. The advantage of using boiled rice/brown rice (as told to me) is, they are easy to handle than the sona masoori or any other polished white rice. Soak the brown rice in sufficient water for 6-8 hours.Drain the water. Grind the brown rice & coconut together to make a smooth batter (Brown rice should be broken to small rava consistency). Batter should be like a thick milkshake (normal dosa batter consistency). Scoop out the batter to a thick bottomed vessel, add coconut oil & salt to it. Cook the batter on a medium heat, stirring continuously. The batter will thicken a become a big single mass (Takes around 8-10mins). Small lumps may be formed, keep breaking them & mixing. Once the batter is cooked, turn off the heat. Start making medium lemon sized balls using the batter. Keep dipping your hands in ice cold water. Note that the balls have to be made when the rice mixture is hot. Place the prepared balls in a steamer & steam the balls for 25-30mins on medium heat. Remove the balls from the steamer, allow it to cool for 3-5mins & serve it hot/warm with a side dish of your choice. 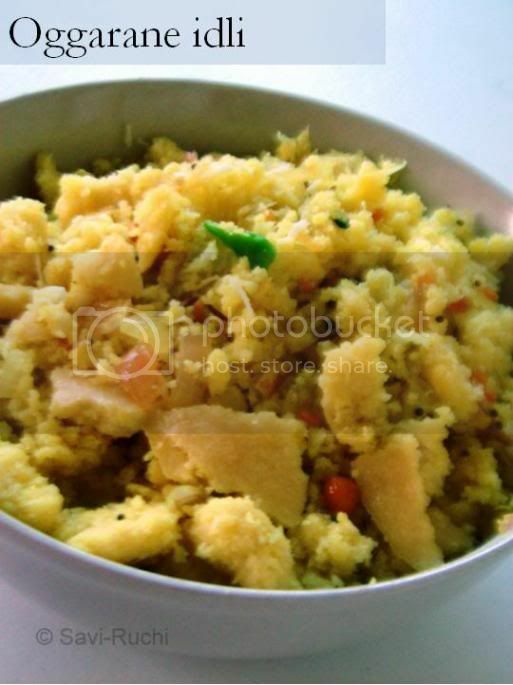 Kadalabele chutney/Gram dal chutney is a great combination for this dish. For other language translations refer here. Dry roast the curry leaves until all the moisture is removed & the leaves become crisp(the curry leaves could alternatively be sun dried or roasted in oven). Dry roast the urad dal/black gram until golden brown. Allow them to cool. Make a fine paste of curry leaves, urad dal, green chilli, salt, coconut, tamarind & jaggery. Add few teaspoons of water to make a paste. Do not add too much water. Boil 1.5 liters of water in broad pot. Add sufficient salt to the water. When water starts boiling, add the rice noodles, few drops of cooking oil & cook it on a medium heat for 2 mins. Turn off the heat & let the noodles sit in the hot water for another 5-7 mins. Noodles become translucent when done. Drain out the hot water & rinse the cooked rice noodles in cold water to stop further cooking of the noodles). Keep them aside. Heat oil in a broad pan, when oil is hot, add mustard seeds, when mustard seeds splutter, add cumin seeds & urad dal. When dal turns golden, add peanuts. Roast peanuts until they are golden brown, follow it by cashew nuts. Add curry leaves & capsicum. Saute the capsicum till half done. Then add in the paste. Saute until the raw smell of tamarind is gone(for 2-3mins, maximum). 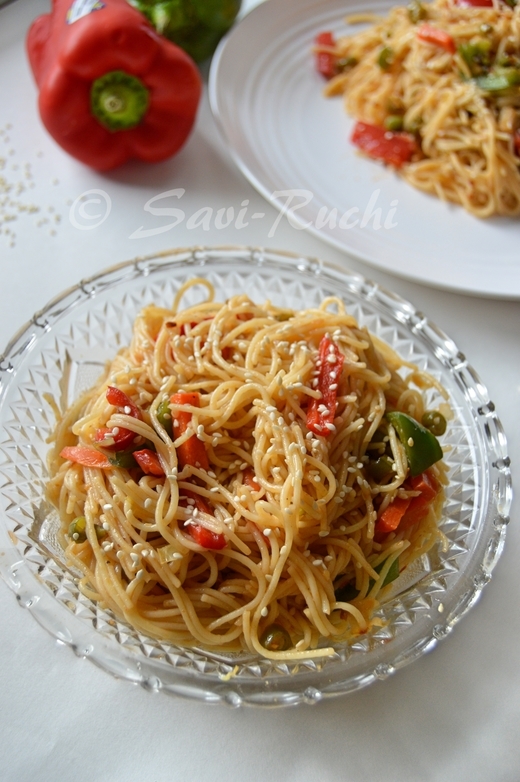 Break the rice noodles & spread them on a large bowl, add the curry leaves sauce, salt (only if needed); mix the noodles gently. Curry leaves noodles is ready to be served. Here is the enlarged image of the same. Thanks for the response. Many got it confused with cauliflower. The first correct answer "Cabbage" came from myspicykitchen. Three cheers to her. 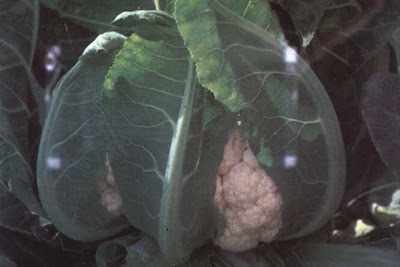 Can you identify this vegetable?? I am not a big fan of masoor (red lentils) dal, because I feel they stand apart even after cooking them. Hence, I always combine them with toor dal/pigeon peas or channa dal (gram lentils) to make it the way we like it. 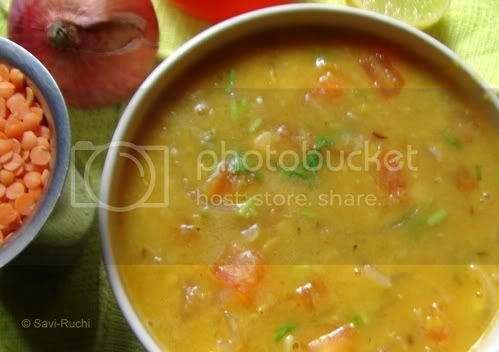 Here is one such simple dal tadka (tempered lentils), that goes in my everyday cooking. Soak the gram dal/channa dal in water for about 30-45mins. Wash both the lentils thoroughly in running water & add 3 cups of water to the washed dal. Add oil, turmeric powder to the lentils & cook it in the pressure cooker for 3-4 whistles. Allow the cooker to cool for 10-20mins. Meantime, finely chop the green chillies, tomatoes & onion. Mash the lentils gently with a potato masher & keep them aside. Turn off the heat & add lemon juice, coriander leaves & mix well. Serve the tempered dal with steamed or lightly flavored rice. Goes well with chapathi/roti too. It is important to soak the channa dal, as it takes more time to cook, while the red lentils cook faster. Leafy vegetables like spinach, methi(fenugreek leaves) could be added to this dal. 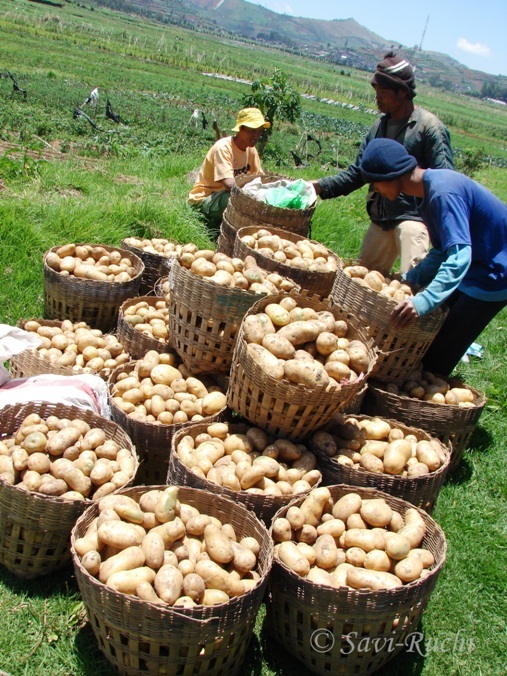 The leafy vegetables must be added along with onions, so that they get cooked properly. 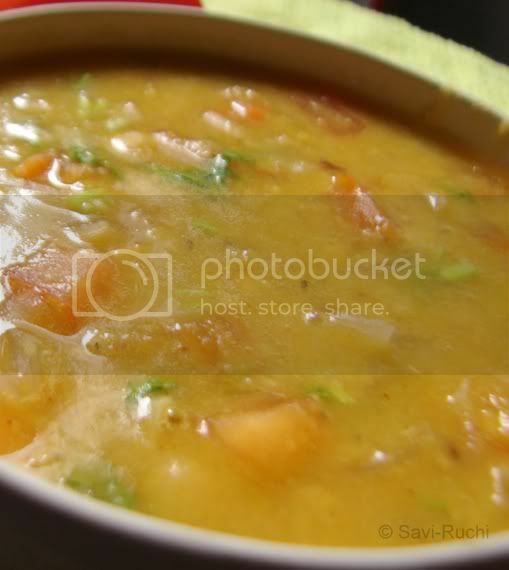 This dal tastes great without lemon juice too. How do you feel when you wake up & notice that your camera isn't working?! On top of it, when you take it to the service center, you hear that the lens has gone bad & new lens costs much more than a new camera ?? Nothing could be done other than being helpless & depressed. Same is the case with me from the last two weeks. I do have few old pictures in my drafts waiting for their turn, but, every time I open my blog, the faulty camera flashes in my mind!! sigh!...Let bygones be bygones..back to recipes. So, here is the recipe for simple oggarane idli. Break the idlis & mash them. Finely chop the onions, green chillies & keep them aside. Heat oil in a wok. When oil is hot, add mustard & cumin seeds. When mustard seeds splutter, add the urad & gram lentils. When the lentils turn golden brown, add curry leaves, turmeric, green chillies & onion. Saute the onion till it becomes soft & translucent. 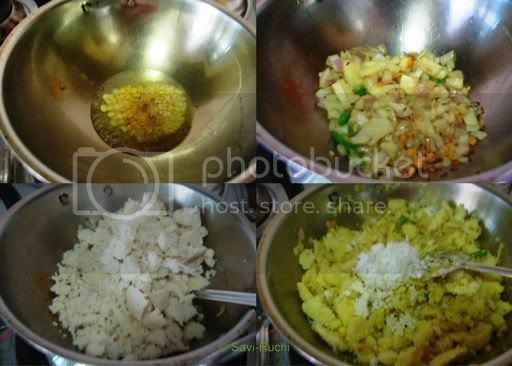 Add salt, sugar & mashed idli to the wok. Mix them gently & allow to cook on a low heat for 5 mins. Turn off the heat. Add coconut, lemon juice. Mix well & serve it hot/warm. If the idlis are very dry, add a few drops of water while cooking. Recipe for idli could be found here.